The Galaxy Note range has been a great success for Samsung, the first version, Samsung Galaxy Note N7000 has an active community and there are developers cooking new Roms. Although Samsung stopped on Android Jelly Bean firmware for N7000 but developer has successfully cooked Android KitKat and lollipop ROMs for Note N7000. Samsung has recently expanded their Note range with the improved Note 4, along with a smarter S Pen it is one of the most powerful device available with Android platform. Powered by a Snapdragon 805 or Exynos variant, 3GB Ram, 5.7 inch Quad HD screen. Many have tested the Note 4 including me. Yes! I have recently purchased a Galaxy Note 4, Thanks to all the readers of my blog. The phone is simply marvelous, but still it comes an exorbitant price and thus you still feel that there are some flaws. The premium handset must be waterproof and sturdy. The Quad HD screen is a great experience when you watch full HD movies on move. The battery life is good to be a whole day companion with mixed usage. I am writing this article to tell you about the rooting procedure. Samsung has made it super easy to root the phone. You just need to have Odin flash tool, download CF root file specific to your Note 4 variant and flash it your phone using odin. Note: Please do understand that rooting your phone has some security issues and risks involved. We should not be held responsible in any circumstances. Although, if you get into any issue let us know. We will surely try to help you. This root method has been tested successfully on following Galaxy Note 4 variants. Step 1: Download the necessary root files linked in above section respective to your Note 4 variant. Step 2: Extract the zip file to a folder. You will find a .tar.md5 file and few dll files. Now, run Right click odin Logo and select “Run as Administrator”. Step 3: Connect your phone to PC in Download mode. For this, Switch off your Note 4, now while holding the Volume down and Home button, press the power button. Now, the phone will start and you will get a screen with yellow exclamation mark triangle. On this screen, you will 2 options, press volume up button to go for Download mode or volume down button to cancel and restart the phone. Press Volume down button and once the phone goes into download mode you will see a big Android robot on screen. Now, connect phone to PC using data cable. Step 4: One you are connected to PC and Odin identifies the device it will show a message in “Com” section. Now, click the “PDA” button and select the .tar.md5 file. It will give a “added” prompt in message section. Just Click “Start” button. Step6: Open SuperSU and if it ask for updating binary files go ahead. Enjoy! Now, your Phone is rooted. 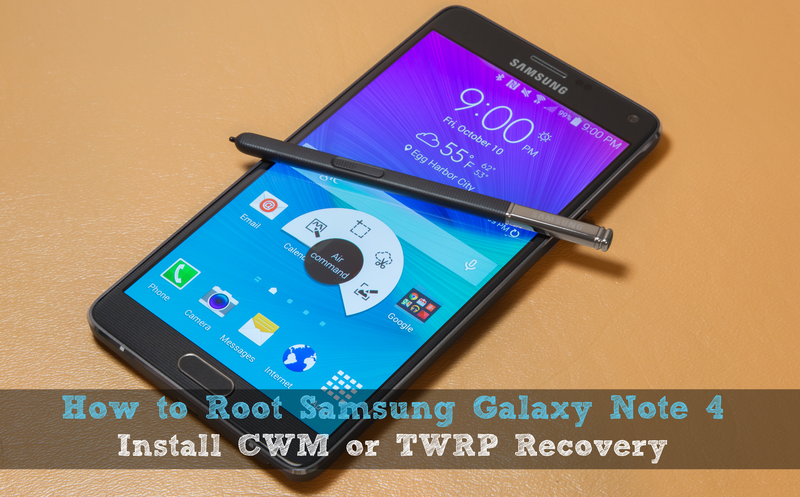 Step 1: Download the TWRP recovery or CWM recovery as per your Note 4 variant using following link. Step 2: Open Odin in administrator mode, and select the recovery file by clicking the PDA button. Step 3: Switch off the phone and restart in download mode. We have explained the procedure in step 3 or rooting tutorial you can find above. Step 4: Once Odin recognizes the device, click start and it will take just few seconds to reboot your phone. To start the phone in recovery mode, Switch off your Note 4. Now, while holding volume up and Home button, press the power button. Release the power button when the first boot appear, keep holding the volume up+ Home until you land on recovery screen. Great! Now, you have a rooted Galaxy Note 4 with custom recovery. Go ahead and try Xposed framework, it can get you lots of advanced featured without installing a custom rom. If you want to get rid of carrier install apps, use our bloatware removal guide. There are tons of custom ROMs available for variants of Galaxy Note 4. We are testing few of them and will be briefing you about our experience on best custom roms available for Note 4 [AT&T, Verizon, T-Mobile]. Stay tuned with updates, join us on social media or subscribe to newsletter.